Amber has long been prized for not only its lush, fiery hues, but its elaborate contributions to Earth’s fossil record. As Vasika Udurawane writes for Earth Archives, the petrified tree resin starts out as a viscous liquid, slowly hardening over million of years and preserving the entrapped remains of creatures that find themselves caught up in the process. To date, researchers have recovered amber fossils featuring such lively scenes as a spider attacking a wasp, an ant beleaguered by a parasitic mite and even a lizard seemingly suspended in mid-air—or rather mid-amber. Until now, Gizmodo’s Ryan F. Mandelbaum reports, most scientists believed that such high-quality fossil specimens were unique to amber. But an intriguing find by gemologist Brian Berger could upend this notion, proving that the slow-forming gemstone opal is also capable of preserving the remains of ancient animals. 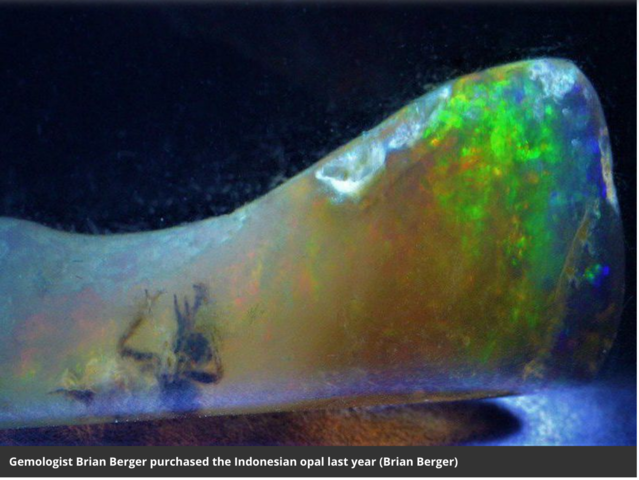 Writing in a blog post for Entomology Today, Berger explains that he recently purchased an opal originating from the Indonesian island of Java. Dotted with a rainbow of colors—from amber-esque shades of yellow and red to neon green and dark blue—the gemstone is impressive in and of itself. Add in the insect seemingly entombed within, however, and the opal transforms from a precious stone into a significant scientific discovery. According to Gizmodo’s Mandelbaum, it’s possible the bug was trapped in amber that then underwent a process known as opalization. Much like fossilization turns bone into stone, opalization can render organic specimens opals’ hapless prisoners. Michelle Starr of Science Alert points out that researchers currently have a limited understanding of opal formation. Right now, the dominant theory involves silica-laden water, which flows across sediment and fills cracks and cavities in its path. As the water evaporates, it leaves behind silica deposits, starting a process that repeats until an opal finally forms. In Indonesia, home of Berger’s specimen, opalization takes on an added twist. Volcanic fluid, rather than simply water, races over the Earth, and fills faults. As the fluid cools down, water contained within leaves behind silica deposits, launching the lengthy journey of opal formation. It’s worth noting, according to Starr, that opalization appears to require a hollow cavity. Amber, however, does not fit these parameters, leaving scientists puzzled over how the opal in question, if it indeed started out as amber, came to be. Ben McHenry, senior collection manager of Earth sciences at the South Australian Museum, tells Starr that the specimen could share similarities with opalized wood, which is a common occurrence in Indonesia. In an interview with Gizmodo’s Mandelbaum, Ryan McKellar, curator of invertebrate palaeontology at the Royal Saskatchewan Museum in Canada, adds that Berger's opal reminds him of a specimen featuring wood partially embedded in resin. The section of the wood covered in amber was preserved much like a fossilized insect, but the other side, exposed to the natural environment, transformed into petrified wood. Reflecting on the find’s potential significance in an interview with Starr, Berger concludes, "If the process of formation is correct, from tree sap with an insect through a sedimentary process, to copal, to amber, to opal it could mean the insect has the possibility to be one of the oldest ever discovered." I think since the prevalence of 3D plant inclusions (appare tly rapidly preserved) in Ethiopian opals many of us have been waiting for a bug in opal. But I didn't expect it to come from I donesia. It was floated for possible sale on Facebook a few months back too, thoigh no price was listed of course. I personally doubt any amber was involved. Opal can apparently form rapidly in some contexts. I once saw a fully opalized gooseberry complete with stripes and seeds inside that a guy had found in Nevada. This was a very fun stone to examine. However, i agree with Stephen and I have no idea why there is speculation that the insect was fossilized in amber, then opal. That seems to be a rather over complicated theory as fossil plants are well known in opal. Are we completely sure that this is a bug ? Some minerals look like plants in their cristallisation but are not. Why couldn't it be an inclusion that looks like an insect but is not . Nature plays that kind of tricks sometimes. Nathan's had a close look at it and he knows what he's doing. Something like this might be ambiguous in the hand but under the microscope it should not be. Oh, let's look for fossils in opal when in Tucson. I was wondering how people knew the provenance of the opal. It is said to be Indonesian, I think. For those who read french. An article explaining how the bug might first have been trapped into amber, then the amber might have evolved through geological and chemical transformations and become opal. If this theory was true, the insect might be one of the eldest ever seen. Nice pictures of the bug, furthermore.